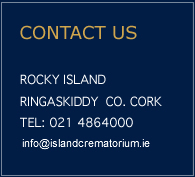 The Island Crematorium is located on Rocky Island in Cork harbour. This island has played an important part in the local history. The building which houses the crematorium was constructed in 1808 as a magazine for storing up to 25,000 barrels of gunpowder. During this time, England was a major colonial power and Cork harbour was an important anchorage for the naval fleet as its size and narrow mouth made it ideal for refuge and defence. A Naval dockyard was established on Haulbowline and through the nineteenth century forts were constructed or re-developed on both sides of the harbour entrance and on the nearby Spike Island. For over 100 years these forts and the magazine on Rocky Island were in use. In 1923 after Irish independence, the dockyard on Haulbowline was handed over to the fledgling state. The military zone on Haulbowline, Spike Island and the forts at the mouth of the harbour remained under British control until 1938. Rocky Island was originally conical in shape. Under the direction of the Board of Ordnance, the island was levelled with the exception of the large rock outcrop in the middle. Entrance to the magazine buildings was through an archway cut into the surrounding bedrock. Large vaults were excavated beneath the levelled surface. Into these vaults were built two magazine buildings, of which only one survives. The original watch tower from the summit of the rock is also gone. One month before the Second World War in August 1939, the Haulbowline Steel Syndicate began production of steel. The company built the bridge that bisects the island in 1966, allowing for easier access to Haulbowline from the mainland. The steel plant was closed in 2001 after 62 years of production. Rocky Island and its 200 year old magazine building was purchased by The Island Crematorium Co. Ltd. in February 2005.